The proposal for an offensive on the Somme battlefront was proposed by the Commander-in-Chief of the French Armies, General Joseph Joffre, as the year of 1915 turned into 1916. Originally intended as a combined Franco-British operation on both sides of the Somme river, the French reduced their participation to a supporting role in the operation as a result of the large-scale German attack on the Verdun front from February 1916. 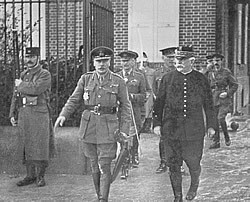 The British Fourth Army was formed in March 1916. It took over the Somme battlefront from the British Third Army between Fonquevillers and Maricourt on the Somme river. The British operational plan for an offensive between Serre on the left wing and Maricourt on the right wing developed during April, May and June 1916. It was approved that the British Third Army would commit two infantry divisions for a subsidiary attack at the same time as the main offensive against the heavily fortified German front at Gommecourt on the Fourth Army's northern left flank. On the other side of the wire opposite the British line north of the Somme river five German frontline divisions were in position to defend their Front Line, with four in reserve and/or at rest. From the early spring into June 1916 the Somme battlefield sector behind the British and French lines was the scene of a huge build-up of troops, artillery and equipment in preparation for the large-scale offensive against the German defensive line. Training and large scale rehearsals were carried out over a period of weeks before the attack. Tons of supplies and equipment, hundreds of guns, thousands of men and hundreds of horses arrived in the rear areas ready for deployment to the forward lines to attack or support the attack. Air reconnaissance, aerial bombardment from aeroplanes and trench raids were carried out over and in they enemy's lines to keep the enemy on his toes, to capture prisoners and gather intelligence about the German units they were up against. As part of the preparations for the large-scale British offensive against the German Front Line north of the Somme river, a mining programme was carried out to lay 8 large and 11 small mines underneath key German positions. The British aim for the mines was to destroy known strongpoints or salients, which were not considered possible to achieve a successful and swift frontal assault. The plan was to create gaps in the German line, cause confusion by the surprise of the immense explosions and knock out German defenders at strategic places. The mines were to be blown on the first day of the British infantry offensive at the moment assigned for the British and French infantry to leave their Front Line positions, these mines would explode with the intention to smash German positions, further weaken the German strength and shock the German survivors as the British made their assault along the German Line. The artillery programme was for a prolonged programme of bombardment, the intensity of which had not been witnessed before on this battlefront. The bombardment was to wear down the morale and nerves of the German defenders, cut through the German barbed wire defences, smash German Front Line trenches and disrupt rear supply routes. 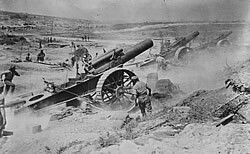 The artillery programme, issued on 5 June 1916, was for a preparatory bombardment to last for five days from 24 to 28 June inclusive. “Z Day” (Zero Day) was scheduled for the infantry attack on 29 June. the next three days would focus on destroying the German defences and smashing the enemy's barbed wire. For this bombardment the British Fourth Army would deploy over 1,400 heavy guns and field guns, over 100 French field guns and howitzers, plus over 300 trench mortars. The seven day artillery preparatory bombardment was on a scale never seen in modern warfare. Final preparations of training and planning were made by the British infantry during the days of the preparatory bombardment. Raids and patrols were carried out into German the positions to capture prisoners and confirm which German units were holding the line. Reports about the wire being cut by the artillery bombardment were varied and at times conflicting. Generally it appeared from these reports that the wire had been better cut on the right of the Fourth Army front, south of the Albert-Bapaume road, than on the left front north of the Albert-Bapaume road. On 30 June messages of encouragement were sent to the men by their commanders. Field services were held in the rear areas by the padres and chaplains. Some units held parades with bands playing. Equipment was cleaned and checked. Letters were written. Each man collected his ammunition. Kit to be carried into battle was handed out. The troops fell in to their units and prepared for the march during the night into the Assembly Trenches in the forward area. Between 02.00 hours and 05.15 hours thousands of British troops made their way on a moonless, but clear night along pre-prepared routes to the forward lines to be in position and ready for Zero Hour at 07.30 on 1 July. The main sources of reference used for the study are listed at the foot of each page as appropriate. In most cases the source of reference is provided as a link to its fuller details given in the Bibliography list.